This past Wednesday, a few seconds of silence preceded the recitation of the Kaddish at the Moshe Saba Masri Synagogue at Hadassah in Jerusalem. As it happens on every other early afternoon, the synagogue was packed for Mincha prayers. 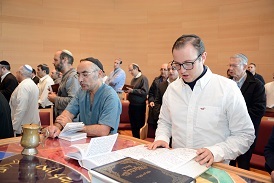 There were doctors, nurses, workers, patients; all coming to enjoy their daily prayer at the new synagogue at the Sarah Wetsman Davidson Tower at Hadassah Ein Kerem. But this time, there was a “guest” who, as the Rabbi told him, was really not a guest, as this was his house, his family’s house of prayer. 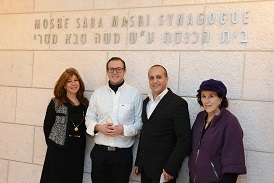 David Saba from Mexico City, the son of the late Moshe Saba Masri and Adela Saba, was standing in front of the Aron Hakodesh, reciting the Kaddish Yatom, the Kadish of the orphan — the first time that a member of the Saba family had led prayers at the Saba synagogue. The Moshe Saba Masri Synagogue, dedicated over a year ago thanks to the generosity of David’s grandparents Alberto and Vicky Saba, was named in memory of David’s father, who had died in a tragic airplane crash together with four other four members of his family exactly four years ago. For David, who has lived with his grandparents since the loss of his parents, this was his first opportunity to visit Hadassah since the construction of the synagogue and the new Sarah Wetsman Davidson Hospital Tower. David walked through the hospital and saw firsthand the incredible quality of care that patients receive at Hadassah. While visiting the new Tower, he expressed his amazement at the standard of the new facilities. In his own words: “In Mexico, even the most expensive private hospital, doesn’t have this level of care and equipment. And here, it is open to everybody regardless of how poor they are. It is extraordinary”. During a visit to the Pediatric Intensive Care Unit in the Mother and Child building, David was witness to how some of the most difficult pediatric cases were being treated and monitored by the most advanced technological equipment. For David, a young student in his early twenties, it was shocking to see a one-month old baby born with a large tumor in his leg, being attached to 10 different machines that were working every second to save his life. He said “I am so proud that my family has had the opportunity to be a part of Hadassah”. The opportunity to pray at “his family’s” synagogue came at the end of David’s visit to the Hadassah Hospital. David entered the synagogue a few minutes before the service was to start. He couldn’t hold his emotions as he saw more and more people coming to pray. He led the prayer from beginning till end. And when the prayer ended, people came to him to thank him for what he and his family had done, and for what they were sure he would continue to do. David Saba brought to Hadassah the spirit of the entire Saba family through his prayers, his singing and his caring.